During the Electronic Entertainment Expo (E3), I spend most of the day on YouTube looking for new game trailers. It's exciting to watch upcoming games and the cool new graphics. Yes, I am a sucker for graphics. I also like to watch these videos in the highest quality possible and hopefully without any ads. Trailers are already ads so I would like to watch my ads without pre-rolling ads please. Unfortunately with that many eyes on YouTube during the event, plenty of people download the trailers for the sole purpose of re-uploading them on their own channel to get views. Most of the time these re-uploaded videos are in lower quality. Every time I encounter these kind of choppy videos slapped with ads and an annoying intro and outro, the first thing I want to do is Mark them as duplicate. On Stackoverflow.com, when someone asks a question that has already been answered, users can mark the question as duplicate. This guides the asking person to answers already present on Stackoverflow and everyone is happy (sorta). I always thought it would be cool to have this same feature on YouTube, where I can simply mark a video as duplicate and the rest of the community can quickly find the original video. Since I don't work at YouTube and can't change their source code, I thought a browser extension should do the job. 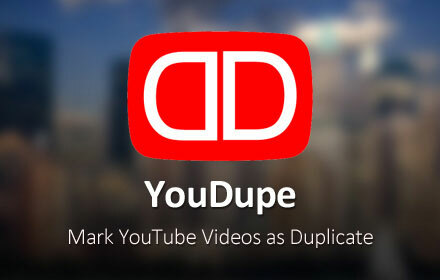 YouDupe is a browser extension that can identify videos as original or duplicates. It is currently available on Google Chrome and Firefox. When you browse a video that has been marked as duplicate, the word [Duplicate] appears next to the title and a box appears below with a link to the original video. You can also contribute when you find a video that seems to be a duplicate. Under the video title, the option to suggest an original is displayed. For now videos are placed in a queue where they are reviewed before being accepted as duplicate or original. The goal is to have the entire process to be handled by the community. Previous: I'm bored, what do I do? Every end of year I look back at what I have done for the previous 365.25 days. And every year I am a little disappointed. I look at the million of ghost projects I started that will never see the light. 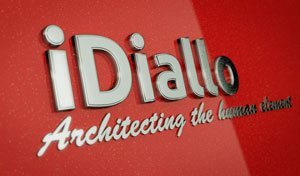 Like every year I believe this time it will be different, I will complete my projects and make my millions of dollars. Looking at it in this angle it is a complete failure. But that's OK. I once heard that it is the little things that matter.